Go beyond square with our new Digital Router! We can now trim virtually any shape and any size to create compelling graphics beyond anything you can imagine. Our router can handle sheets and rolled media up to 12' long and 7' wide for cutting without limits. Every curve, every nuance of your image is carefully followed with exacting precision. Trim along the outside of the image or we can cut out the inner image, such as a screen on a phone. 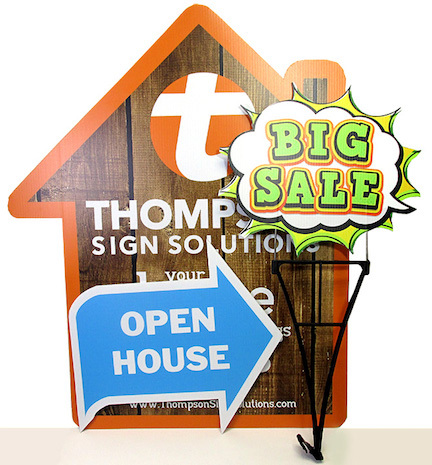 Your display pieces will be compelling and attention grabbing. Setup and file prep is simple. We add a cutting path to your image in Adobe Illustrator and print a barcode to the printed graphic. Our digital router reads and communicates with our printers and transfers the cutting path information to the precision blades. Give us a call or email us and we'll help you transform your graphics! Watch our new digital router in action! Opens in a new window.